The Mars Curiosity Rover has been busy at work for just over 2 years now. And as the “Sol”s roll by, one could be forgiven for asking: what has the thing learned so far? What has it been up to? I’ve created a Google Earth KMZ file, updated here as frequently as I can to make sure all the info is in one place. Feel free to post feedback, comments & suggestions to this page and — I’ll see what I can do! Instructions on configuration of a smart phone (either iPhone, Android or any others that support Google Earth) are now linked into this page. 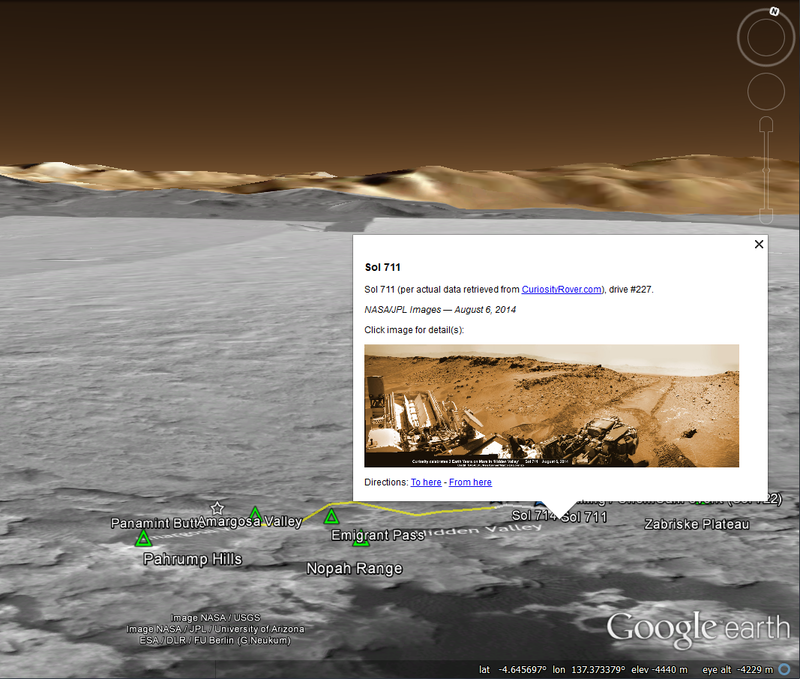 Now you can track the Curiosity Rover on tablets too! Follow the highlighted, bold-faced link and learn how to set it up in 12 easy-to-follow steps. Leave any pertinent questions here so others can benefit from your experience. The upload for 735 contains a little bonus…you’ll find a link on the current position of MSL to “Micorosoft Photosynth” and an item on my page there (ross204). This gives a panoramic view, compositely rendered from the Left NavCam data uploaded by MSL this Sol. More sophisticated uploads will follow in the future, when imagery makes such things possible.